San Francisco: Like old British sports cars, the Mazda Miata has great handling, good looks, and a well-developed understanding of driving fun. Unlike those British cars, though, the Miata starts every time you want it to. You've probably seen commercials where a man looks for every possible excuse to drive his new car. He'll take it to the grocery store, fill it with gas even when the tank is almost full, and intentionally forget to run errands just to spend more time behind the wheel. But come on - do people really feel that way about their family sedan? A Mazda Miata, though, is the kind of car that people really make excuses to drive. Since its introduction in 1989, the little Miata convertible has been therapy on wheels. Drop the top, fire up the engine, shift into first gear, and it's like you've slipped into a driver's paradise where nothing can make you stop smiling. The wind in your hair, the sun on your face, and the musical burble of a classic sports car's exhaust note are all it takes to wipe away the day's troubles. It's easy to fall in love with this car. Why? For starters, it has a firm road-gripping suspension that lets the driver sense the car's every move. Coupled with a low seating position and lightweight construction, this makes the Miata feel like a car you wear, not one you ride in. Step down into the cozy cabin - some would call it cramped - and you'll find the Miata fits like a perfectly tailored suit. All the controls, especially the gear shifter and steering wheel, are exactly where they should be for a comfortable, natural driving feel. It's as if you sat down in an empty room, and suddenly a sports car organically grew around you. Performance-wise, the Miata impresses in every area but one. On the positive side, its transmission is among the world's best, with short, crunchy shifts that make the driver feel like he's directly connected to the engine. It's like flipping a toggle switch with a quick, precise mechanical reaction. Steering also feels remarkably tight and responsive, giving the driver plenty of feedback through corners without feeling jittery on the highway. Similarly, brakes are firm, the clutch is easy to press, and handling is fantastic. The only performance weakness is the Miata's engine. It makes 142 horsepower, which is plenty for spirited driving but not nearly enough to keep up with the 240-horsepower Honda S2000 in the lane next to you. 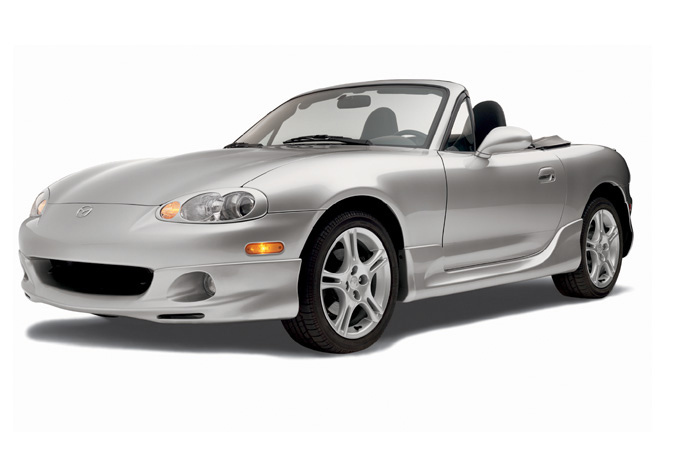 It's important to note that the S2000 costs $10,000 more than a basic Miata ($21,868), but it still shows that the Miata is no screamer. Nor does it try to be one. Instead of focusing on straight-line speed, the Miata is all about balance. Weight distribution is near a perfect 50-50 over the front and rear axels, so it's easy to steer with the throttle by applying more or less gas as you drive through a high-speed corner. Despite this focus on balance and handling, we're glad to see Mazda introduce a limited edition, turbocharged Miata from its Mazdaspeed division this year. We'll reserve judgment on that car until we've driven it. Other than the lackluster power, there are only a couple of downsides. The most obvious is practicality, since it lacks both a back seat and much in the way of storage space. It's also starting to show its age in the cabin, where hard plastics and outdated control knobs haven't changed much since 1989. An all-new Miata is rumored to be ready for sale sometime in 2005, and, if history repeats itself, we can expect the next Miata to be bigger, heavier, more powerful, more luxurious, and more expensive. On a foreboding note, those are the same steps that killed Mazda's RX-7 sports car a decade ago when it became too heavy and expensive for its core group of buyers. With any luck, Mazda will learn from its RX-7 mistake by keeping the Miata's original traits that made it the best-selling sports car in the world. It should be lightweight, small, inexpensive, good-looking, and above all, fun to drive. In other words, it should keep the Miata's timeless formula for fun. Important controls in the Miata's cozy cockpit are arranged to feel natural and comfortable for the driver, especially the steering wheel and gear shifter. It remains the bargain-hunter's sports car with a starting price under $22,000.